Size of Male: 100-130 lbs., 25.5-28.5 in. Size of Female: 80-110 lbs., 23.5-27 in. The Greater Swiss Mountain Dog is a happy, sociable breed who enjoys being around people and children. The “Swissy” is usually an active and enthusiastic dog but they are also calm and dignified. They are very confident dogs. This working breed is a very large breed and they are physically powerful. Despite their size and strength they’re also very agile. They enjoy obedience work, herding, weight pulling and other activities with their owners. The Swissy is a tri-color dog — primarily black with rust and white markings on his legs and face. He has a short, smooth, dense coat. 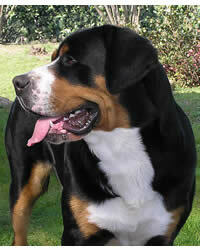 Also known as the Great Swiss Mountain Dog, this breed was developed in the Swiss Alps. They were probably the result of crossing large Mastiff-type dogs with the local dogs of the region when the Romans invaded the area some 2000 years ago. At one time the Swissy was thought to have been the most popular dog in Switzerland but they nearly died out in the late 19th century. The breed was only rediscovered in the early 20th century. However, the Greater Swiss Mountain Dog remains something of a rare breed in both Switzerland and the United States today. The Swissy has a very loving and devoted temperament. They love to be around people and they are very gentle with children. They crave attention and they’re very physical dogs. They like to have lots of petting. They are also very eager to please their owners. They are very intelligent dogs. They have been working dogs for centuries and they enjoy having a job to do. They are usually good with other pets. They make good watchdogs but they are not threatening dogs. Living Environment – The Greater Swiss Mountain Dog is a very large dog and they do best when they have room for exercise. However, they do not do well as a kennel dog. They need to have regular human contact. Grooming – The Swissy has a short, dense double coat that is relatively easy to care for. They require brushing once or twice a week. They are average shedders. Diet & Exercise – The Swissy is a very large dog and he eats accordingly. You will need to be careful when feeding a puppy and choose a food for a large breed puppy. Puppies should not be overfed. If they grow too fast it can lead to bone and joint injury. Swissy puppies should also have their exercise monitored so they don’t injure themselves. With their large size and dark, thick coat, owners should make sure that these dogs don’t overheat in the summer. Health – The Swissy is considered healthier than many dogs of similar size. However, they are subject to a few health problems such as urinary incontinence, eyelash problems (distichiasis and entropion), lick fit (frantic licking), epilepsy, bloat, problems with the spleen, and elbow and hip dysplasia. You should talk to a breeder about health issues before getting any dog. In the dog training arena, the Greater Swiss Mountain Dog is considered to be a very intelligent dog. They like to please their owners. However, they can also be determined and stubborn at times. According to breed experts the Swissy can be hard to house train. They may understand the idea early in the training but it may take a while for them to follow through. Otherwise, the Swissy can be very good at obedience work, rally, agility and other kinds of dog activities.